Belmont School of Music alumnus Dr. Timothy Sharp was honored with the 2017 Encore Award last night, Tuesday, Sept. 12, on Belmont’s campus. Sharp is currently the Executive Director of the American Choral Directors Association (ACDA) and the Artistic Director of the Tulsa Ontario Chorus. 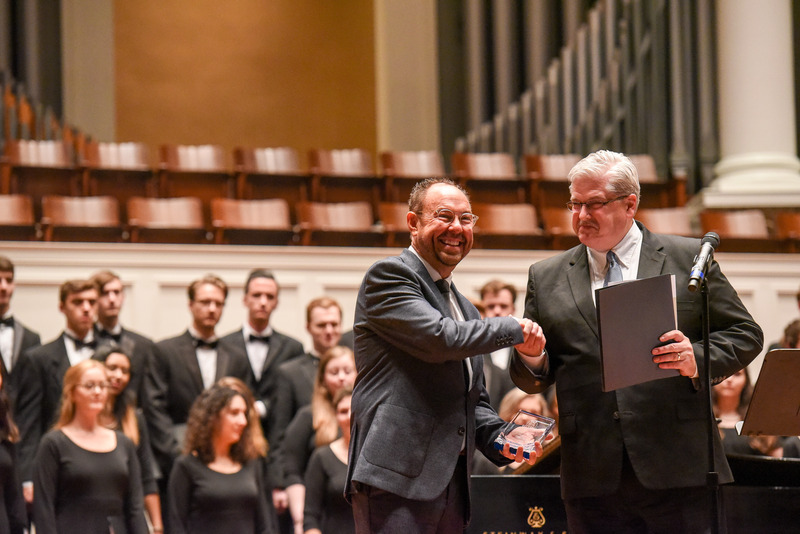 Prior to his leadership of ACDA, Sharp served as the Dean of Fine Arts at Rhodes College in Memphis and previously served as Belmont’s Director of Choral Activities. Additionally, he served as a Belmont faculty member and conducted Belmont Chorale and Oratorio from 1997-2000. Sharp’s research and writing focuses on conducting and score analysis, and his interests vary from regional music history to acoustics and aesthetics. He has experience conducting university, community, church and children’s choirs, and he continues to serve as a choral conductor and clinician throughout the United States and internationally. After the award presentation, Belmont Chorale performed under Sharp’s arrangement of “When I Can Read My Title Clear” and “What a Wondrous Love is This,” co-written with Wes Ramsay, under his direction. The program was an autobiographical description of his journey as a musician. The Encore Award was created in 2008 to honor a School of Music alumnus for achievement in the field of classical music. Previous honorees include Clifton Forbis (2008), Daniel Weeks (2009), Drs. Daniel and Sharon Lawhon (2010), Maestra Teresa Cheung (2011), Dr. Alfredo Colman (2012), Travis Cottrell (2013), Greg Walter (2014) and Tina Milhorn Stallard (2015). The award presentation and performance are free and open to the public.